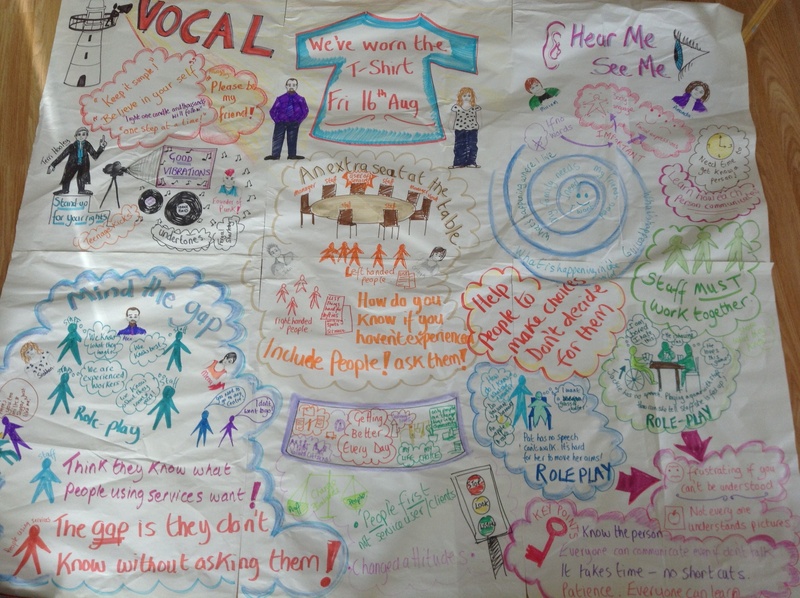 ‘Vocal’ is a Belfast based Advocacy group who had their first conference on Friday 16th August. The day was fantastic and well attended. Launched by Terri Hooley ( the man known as the ‘God father of punk’) who recounted some great stories of his life and experiences and enthused everyone to believe in them selves! ‘Spotterart’s Shirley Potter was at the conference to draw ‘what was going on'(this is also known as ‘Graphic facilitation’). This is where everything that ‘happens’ at your conference or event is recorded in a large drawing. This includes what the speakers or presenters have said, what the workshops or group work was about and any important things that have been said throughout the event. The artist will produce a large picture (or several pictures dependent on the size of the event and numbers of speakers, workshops etc), usually around 2 meters by 3 meters in size. It will comprise of a number of pictures and some key words that will summarise what has been or is going on. This is usually completed whilst the event is taking place, so that people can have a look and see how the day is developing and what the main messages of the day are. At the end of the event the large picture/s are finished and placed in a position where those attending the event can take their time to have a look. The pictures can then be photographed and can be displayed on websites or printed copies can be made and distributed providing an excellent summary of the conference or event. For more information see the Drawing ‘What is going on’ or ‘Graphic facilitation’ page. Shirley completed a large drawing whilst at the ‘we’ve worn the t-shirt’ conference, this summarises the introduction made by Terri Hooley and each of the workshops along with some general comments of the day. You can quickly see what the day was all about with out reading through lots of notes, minutes or presentations. See the attached image which shows you at a glance what happened throughout the conference. The event was co-chaired by Siobhan and Alex who is also one of the co-trainers at Vocal. There were 4 exciting workshops which had a real impacted on those present, with participants leaving with clear plans and ideas of how they can ensure that they are including the individuals who use services in the decision making processes in their organisations. The photograph shows the ‘graphic’ which was produced on the day, it summarises what happened throughout the conference. As you scan across the picture you can see the main points of each workshop in a clear and easy to understand format. There is no need for lots of lengthy typed up notes, just a quick look at the ‘graphic’ shows you all the main points of what went on. Shirley is now taking commissions for Christmas! Great news Shirley is now shining her light!!! Shirley has been painting for many years in her ‘spare’ time but has now decided she can devote more time to her Art work. You can own a unique original drawing or painting designed just for you!